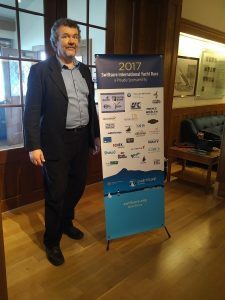 Alastair Chesson, principal and owner of AC Design produces professional graphics for businesses and continues to grace Swiftsure International Yacht Race with his work. From Swiftsure’s poster, distributed throughout the Pacific Northwest and beyond, to creating banners that give Swiftsure polish, Alastair has flair and creativity. Alastair instructs with the Pacific Design Academy, where he teaches students to harness their artistry, anchor it and express through technology. Graphic Media Design Instructor at Pacific Design Academy, Victoria’s longest-running Graphic Design program. Alastair studied at the Alberta College of Art & Design, and his interest in other cultures led him to Berlin where he receiving his B.A. in Visual Communications from the University of the Arts. He lived in Berlin for over 20 years before returning to Victoria in 2005. His experience ranges from freelance designer to Marketing Communications Manager for multinationals in Europe including Sony’s IT division. He was responsible for managing web, print & advertising campaigns, as well as exhibitions, product packaging, POS displays, sales incentive tools and giveaways.